Pictured above is the Cersie Chair by Andrew Martin from Resource Decor. 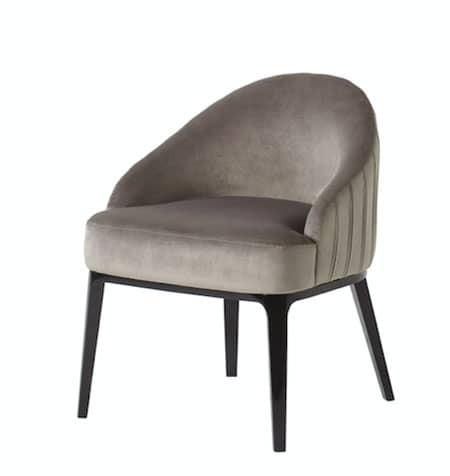 Resource Decor recently announced the introduction at the upcoming Las Vegas Market of the Cersie Dining Chair by Andrew Martin. This low-backed dining chair provides a supportive seat and sleek, low profile, facilitating an unobstructed view of the room or table. Vertical pleated stitch detailing on the back of the chair adds visual interest on approach, and a solid wood base, finished in a sleek black gloss, accentuates the tapered flow of the legs to the floor. Resource Decor's Made to Order Upholstery program offers possibilities for every lifestyle and living space. Wrap a chosen frame in the fabric or leather of your choice (over 100 designer styles to choose from.) Many are part of our ‘in stock fabric’ program, guaranteeing shipment from our facilities within 30 days. Martin Waller is the founder of iconic British furniture and textile brand Andrew Martin, whose pieces can be seen on film sets ranging from Harry Potter to Gladiator to the homes of Ridley Scott, Victoria Beckham, Tom Ford and Samantha Cameron. He is known for his masculine, whimsical and eclectic design and pattern that pairs everything from overstuffed vintage leather Chesterfield sofas to tin gorillas to fabric with faces of The Beatles woven onto it. Nicknamed by the press as "the Indiana Jones of design", Martin travels the globe to source product and find inspiration for his latest design collections, and his iconic Andrew Martin Design Awards have selected winners throughout the years that include Nicky Haslam, Axel Vervoordt and Martyn Lawrence Bullard. More about Resource Decor: Resource Decor is a design and distribution business for premium home furnishings and lifestyle products. It is a subsidiary of Rochdale Spears Group, a vertically-integrated global design, manufacturing and distribution enterprise providing high-quality furniture and accessories. The Group continually invests in design and product development and employs over 3,500 people around the world. It is a trusted manufacturer of high-end furniture and supply major retailers globally. In addition to its manufacturing arm, Rochdale Spears Company, the Group launched SONDER living, a shop-in-shop retail concept, and Projects by Resource Decor, its hospitality division, in 2016. For more information, visit ResourceDecor.com.